Belts also worked great for 3rd seat when added to rear cargo area of the FJ60/62. Lap belts fit front or rear seats. 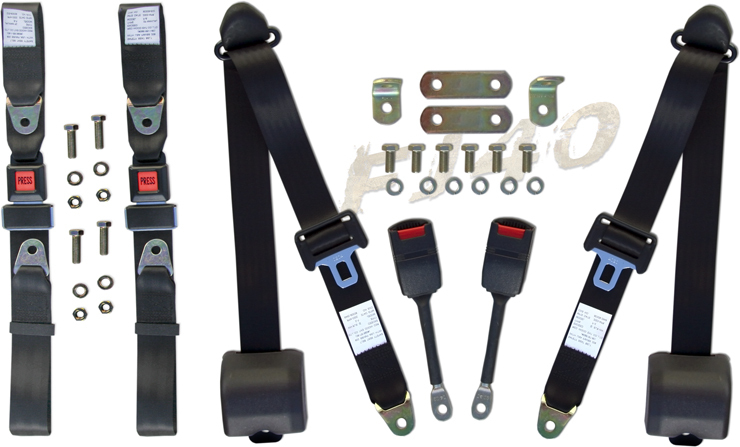 Belts also fit aftermarket rear bench seats that face forward and bolt to rear floor. 4 ea. additional "J" - 2 1/2" w/ 7/16" hole - reinforcement plate washers are recommended to install under floor / bed to secure belts to rear floor. See Seat Belt Hardware. Belts sold in pairs w/hardware. Belt Length will cross & hold rear jump seats upright on FJ40s. Select: Select Kit by Year8 Bolts/Flats/Locks '73 to '8410 Bolts/Flats/Locks '65 to '71(+$1.25)"